Unlike most other companies, our Custom Shop is truly an "Options Shop." If you are a discerning player and want something specific, we will go the extra mile and make it happen. Keep in mind, you are not paying for additional quality at our Custom Shop, only for the options you specify and consultation. Our standard models are made on the same line, by the same people with the SAME DEDICATION TO DETAIL. We also provide Services for re-frets, setups and custom necks, etc. If you want something special, Contact Us. Do you have a guitar in your head that you've been dreaming about? We have developed the technology to take your ideas (graphics files, drawings, etc.) and convert them into real working guitars - affordably and with a quality that is on par or better than some company's "Masterbuilt" line. With reasonable lead times, you could be playing your custom designed guitar in as little as 4 weeks. Inquire about the process. Our construction techniques ensure long lasting durability. We use only the finest ethically harvested certified tonewoods available ensuring the most reliable build methods. We also match resonance between the various woods (even fretwire and pickups) culminating in a finer instrument than what you would find in all but a few retail shops. Our bodies and necks are constructed using only the finest tonewoods. We hand select all lumber we use. We are also as green and ethical as possible. It is heart breaking to think of these beautiful trees getting cut down, so we go to great lengths to make sure their legacies are preserved and their souls ring true in guitar form. 100% of our lumber comes from certified means of harvestation. We keep an inventory of carefully selected tone wood in stock. If you require something really exotic, we can usually get it for you granted it was harvested ethically. Check for availabilities. All of the parts and electronics that we use are of the highest quality and manufactured in the USA. The bridges and tuners are from Hipshot. It is our opinion that the Hipshot tremolo is the absolute finest in the industry. It pivots on ball bearings and is smooth silk. 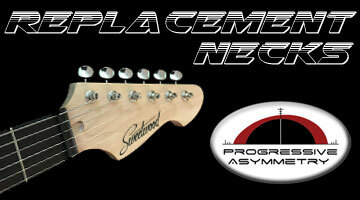 I could go on... We can also order any bridges and accessories you desire, whether it be a "b-Bender" or a Floyd Rose. For wiring, all guitars are come with standard (series) wiring. Our pickups (on humbuckers) are 4 conductor and can be split/series/parallel. We can accommodate a variety of circuits. As standard, we use SimTec for our finishes. It is a catalyzed poly specially formulated for guitars. Unlike other poly's, SimTec actually sounds good. Most poly's bond physically. The end result, it has the same tonal characteristics as fully cured nitro-cellulose lacquer, except you don't have to wait 50 years. Additionally, it is more durable, clearer, colorfast and smoother feeling. It doesn't suffer from "sticktion" that is a common plague for instruments finished with nitro. The standard in gloss finish. The purists say it breathes and sounds better. Well, if you have to have it, we can do it. There is a substantial upcharge for Nitro as it takes literally 3-4 times longer to apply and polish. We also offer a two part oil finish. This beautiful satin finish that has a nice smooth feel, similar to the stock of a gun. Guitars with oil finishes sound more natural than those finished in lacquer. Oil does not inhibit the natural vibration of the wood and sounds excellent - perfect for a studio guitar. Downside, it's not as durable. Upside, easy to steam out dents and re-oil. © 2017 Sweetwood Guitar Co. All content copyright Sweetwood Guitar Co.